The Easter Story is told in an animation at Cbeebies, this is ideal for younger children. It does not deal with the crucifixion at all, just Jesus coming back to teach everyone on Easter Sunday. This is animated with sand drawings. The illustrated Easter Story told by TopMarks covers all of Holy week and is better for KS2 children , especially lower KS2. There is also a set of resources to go with the story book which is ideal for sharing on an IWB. The resources include information about Shrove Tuesday, Ash Wednesday, Palm Sunday and explaining a little about the customs of Easter Eggs and Easter bunnies. 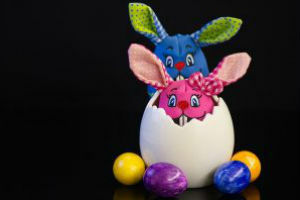 There are also activities including a counting game, making cards, pintables and Easter Nests. The whole site is child friendly. WhyEaster share the Full Story. It is a richer text and better for upper KS2 but there are not extra activities offered; it is simply the whole story. This is also available as a downloadable PDF so could easily be used to create a comprehension exercise, gap fill, etc.